London’s King’s Cross St. Pancras underground station has been the unfortunate location of two major incidents within the last twenty years. A fire in November 1987 and the terrorist bombing in July 2005 both resulted in the loss of lives, and the injury of many people. The implementation of measures to mitigate or neutralise the effect of all possible future incidents at this site is unrealistic. The adoption of preparedness measures is crucial for the emergency services to limit the loss of life and property, and to improve the response phase of an incident. King’s Cross St. Pancras underground station is currently being redeveloped, partly to mitigate the remaining few operational and safety issues identified after the 1987 fire, and also to allow for a predicted increase in passenger use. Despite these modifications and improvements, both the surrounding built environment and the station will necessarily remain complex structures. The local emergency services have several duties placed upon themselves in the event of a major incident at this site, and a computer based model capable of examining the effects of different incident assumptions or contingencies has been identified as potentially beneficial to the local National Health Service resilience planning department. The specific aim of this paper is to provide the reader with an overview of this research project. To begin, the aims and deliverables are identified. In light of these, principles of pedestrian evacuation modelling are presented, highlighting a shift in approaches: from aggregate movement, to individual-level movement and behavioural models. The feasibility of using a proprietary pedestrian evacuation model to achieve the research goal is discussed. This is followed by an agenda for developing an agent-based pedestrian evacuation model using the Repast toolkit. 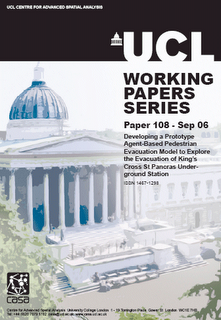 This paper concludes with progress of the prototype model to date. Keywords: Pedestrian evacuation modelling, Agent-Based Modelling, Repast toolkit, London’s King’s Cross St. Pancras underground station.